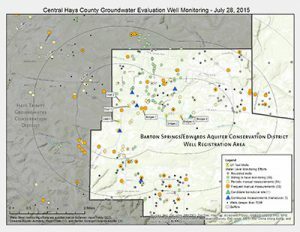 June 19, 2015 marked the effective date of HB3405, which brings the previously unregulated aquifers in Hays County under management of a groundwater conservation district–the preferred method of groundwater management in Texas. The Hays County Trinity Aquifer annexation is now official. Now that HB3405 has become law, the Barton Springs/Edwards Aquifer Conservation District (District) is tasked with managing all non-Edwards groundwater withdrawals (primarily Trinity Aquifer wells) in central, southern, and eastern Hays County. 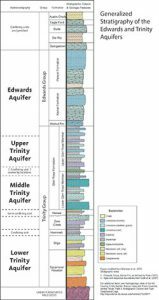 The Edwards Aquifer Authority shares jurisdiction in the same area, however, their authority is limited by statute only to Edwards Aquifer wells and requests for drill-through permits for wells that penetrate the overlying Edwards Aquifer. Several town hall meetings and neighborhood question and answer sessions are planned to inform residents about the new bill, policy changes, and resources and requirements for well owners in the annexed area. The District is collaborating with Hays County Commissioner Will Conley and Representative Jason Isaac to host the Town Hall meeting. The goal will be to have the meeting video taped and digitally archived online for those residents that cannot attend. Details will be announced as they are finalized. 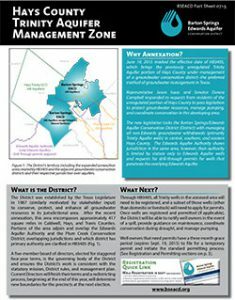 Are you in the new Hays County groundwater management zone (shown in green)? 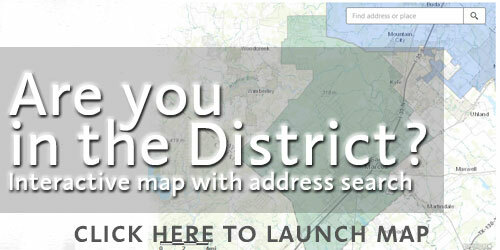 Type in an address in the search bar or use the zoom features to navigate within the interactive map. Click on View Larger Map to expand the map in a new window. 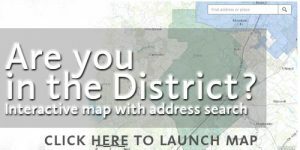 Download the updated District boundary as a Google Earth kmz file. HB 3405 was filed by Representative Jason Isaac. Senator Donna Campbell carried the companion bill. HB 3405 is an act relating to the territory, jursidiction, and powers of the Barton Springs-Edwards Aqufer Conservation District, including its authority to regulate certain wells for the production of groundwater. HB3405 became law on June 19, 2015. The District updated its Rules and Bylaws to address the new requirements on July 16, 2015. Archived Trinity Well Drilling Spotlight with maps, etc. Low-production (less than 17 gpm) domestic and livestock wells do not need a permit, they only need to be registered with the District. The well registration provides contact information and basic well details, so the District can better understand groundwater use in the area when permitting larger users. Permitted wells cannot cause unreasonable drawdown in neighboring wells and must not jeopordize the overall sustainability of the aquifer. An aquifer test is part of the permitting process for permits requesting volumes over 2 million gallons a year. The number of nearby registered wells will be factored into the aquifer test. No fee, no meter — Existing nonexempt domestic and livestock wells in good working condition do not have any other requirements beyond well registration. Protect your well — Registered well owners within 1/2 a mile of a proposed nonexempt well will be notified and may be monitored for unreasonable interference during aquifer tests. Receive notices — Registered well owners will be notified in the event of a spill, water quality issue, or water level decline due to drought or an adjacent pumping center. Participate in District programs — The District hosts an annual water well checkup, scholarship contests, and various educational events. If a well does not meet the exempt status criteria then it is considered a nonexempt well for which a permit is required to authorize groundwater withdrawals from the aquifers managed by the District. HB 3405 is now effective and provides existing well owners an opportunity to receive a Temporary Permit that provides well owners an interim authorization to drill or operate during the timeframe in which a Regular Permit is being processed for the well owner. Well owners with existing nonexempt wells have until September 19, 2015 to submit an application for a Temporary Permit and begin the process for a Regular Permit.